Elmedia Player is a video and audio player that will play virtually any file you throw at it, be it MP4, AVI, MOV, SWF, DAT, MKV, MP3, FLAC, M4V, FLV or any other common format. No need for additional codecs, plugins – this app has everything you need for your files playback. Elmedia Player guarantees a perfectly smooth HD experience thanks to hardware accelerated decoding. Supports multiple audio tracks, including embedded ones as well as external audio files. Full-screen mode that even offers you a choice, which monitor will be showing the full-screen video. Creation and easy control over playlists. The player can be conveniently pinned on top of all active apps. Fit the image to screen. The playback speed is easily adjusted. Play the selected video or audio segment in a continuous loop. Choose which external audio tracks or subtitle files the player will load: all with movie name, same name as movie or all in directory. Stream local files to Chromecast, Apple TV, Smart TV and other AirPlay and DLNA-certified devices. With Elmedia Player installed on your Mac you'll be able to effortlessly stream local video and audio files to Samsung TV, LG TV, Sony TV, as well as many other smart TV sets. Streams audio and video files in their native formats or transcoded in real time. Supports streaming of up to 4K videos to compatible devices (Chromecast Ultra, Apple TV 4K, etc.). Supports subtitles (both embedded and external). Streams content from YouTube, Dailymotion and Vimeo without ads (via the Open Online Video option). Supports playlists (create your very own playlists for uninterrupted streaming). Control your streaming in the app. You can play, pause, seek, or stop the video playback. When streaming to Chromecast or DLNA devices you can also adjust the volume in player. 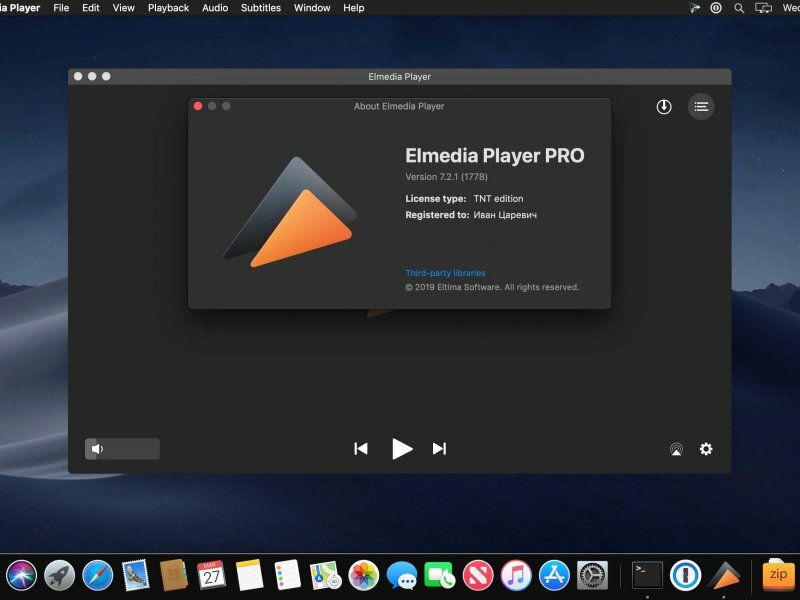 You can also use Elmedia Player as an audio receiver for AirPlay, which comes in handy when you need to stream audio from your phone to a Mac connected to larger speakers. We have integrated Elmedia Player with opensubtitles.org service, which allows you to find any subtitles available there in a couple of clicks without leaving the player. Flip vertically, rotate, mirror videos or revert to original. Adjust video brightness, contrast, saturation, and more. Sync subtitles to the video in case it wasn't in sync originally. Choose the language for audio and subtitles when files have multiple subtitles and audio streams. Adjust the sound for different genres, rooms, or specific speakers with the audio equalizer. Select one of the presets or create your own. You can set an output device for audio; for advanced users: transmit AC-3/DTS through S/PDIF. Access YouTube, Vimeo, and Dailymotion videos directly from the app without bringing up a browser; no noisy ads to distract you with Open Online Video option. Make a screenshot of any moment in the movie or make an entire video into a set of images. Set the preferred interval between screenshots. Elmedia Player Pro 7.0 (1615) crashed after install. It will not open. Gatekeeper is disabled !! New Version Elmedia Player Pro 7.0 (1618) works !! !